Did you know that getting your teeth straightened can be a form of restorative dentistry? This is because restorative dentistry seeks to restore or bring your smile to a more perfect state. Crooked teeth can become straight, which in turn starts to relieve the burdens of tooth decay, gum disease, bad breath and other oral health problems. If you want to restore your smile once more, see what our 4 different orthodontic options can do for you! Why Is Your Smile Important? Some patients don’t realize just how important a smile really is. Studies show that your smile is one of the first things another person will notice about you. Is that smile showing that you are healthy and confident? Or do you hide your smile because of crooked teeth, discoloration or other aspects you don’t like? When a smile looks good, studies show that people often feel more confident and they exude that confidence much easier. A better smile can lead a person to be more social and confident to pursue successful endeavors. 1/3rd of people notice a person’s smile before any other feature. Those who have a straighter, more beautiful smile are 45% more likely to get a job over a competitor with a crooked or discolored smile. Your smile can send messages about how healthy you are and how happy you seem. When that smile is straighter and more beautiful, others will see you as 21% more likely to be healthier and 47% happier. 73% of people are more likely to trust you at first glance if you have a better smile. You’re 58% more likely to be perceived as wealthy and 57% more likely to get a date if you have a great smile. Your teeth will determine most of how good your oral health. When you eat, sugars in the food you eat mix with mouth bacteria. That creates plaque, or that sticky, acidic substance that coats your teeth. Over time, if proper oral hygiene habits aren’t observed, the teeth will change colors and decay. This happens much easier to the teeth if they are crooked. That’s because it’s harder to clean between the teeth if there is no way to get floss through crooked teeth. 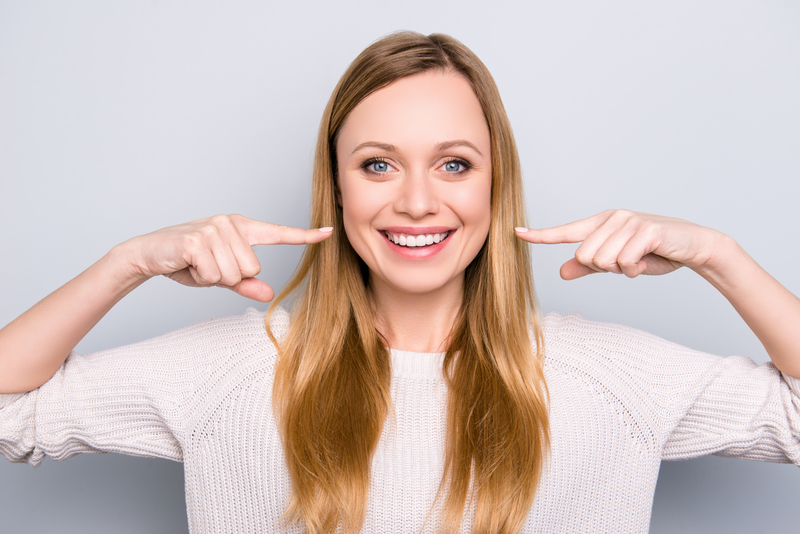 Restorative dentistry seeks to restore smiles that are crooked or damaged through decay or gum disease (a disease to the gums that happens just like tooth decay). This form of dentistry consists of dental services such as teeth whitening, same-day crowns, root canal therapy and tooth-colored fillings. There are many dental patients that will get dental veneers—also known as “porcelain veneers”—to restore their smile. This is a dental service where the top layer of your teeth is taken off and replaced with a perfect, white tooth shell. However, once that part of your natural tooth is taken off, you can’t get that natural part back. Porcelain veneers do make your smile look beautiful, but they don’t change your crooked teeth or oral health issues underneath. Fixing the problem permanently is a great solution to getting a beautiful smile and reducing your problems with tooth decay, gum disease, bad breath and more. Straighter smiles are ones that are easier to clean and ones that look attractive and healthy. Plus, once you straighten your smile with orthodontic treatment, it can stay that way for life. Orthodontics is different than dentistry, but is absolutely important to your oral health. Dentists will fix problems with tooth decay and gum disease. Orthodontic treatment and restorative dentistry through those braces can help prevent problems in the first place. 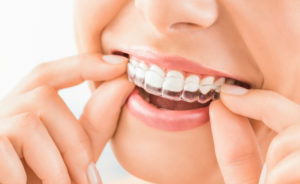 Plus, orthodontic braces are able to correct bite and alignment issues that are caused by misaligned bites and jaws. Those issues can cause speech and development problems without intervention. Without orthodontic treatment, other restorative dentistry methods can only do so much. Our easiest method of restorative dentistry for teens and adults is through Invisalign treatment. This option works just as well as our lingual braces, ceramic braces and traditional metal braces. However, with Invisalign, the focus is on aesthetics as well as straightening. We want you to have a beautiful smile as you straighten, and Invisalign is a great way to achieve that. Invisalign is a orthodontic treatment that is designed to be virtually unnoticeable on your teeth. Patients have their teeth digitally scanned in-office and a treatment plan is made for them, mapping out how orthodontic treatment will transform their smile in 18 months or less. Often, patients can straighten their smile in 1/3rd of that time, depending on the condition of the teeth, bite and alignment. Less office visits are typically needed for this type of restorative dentistry. 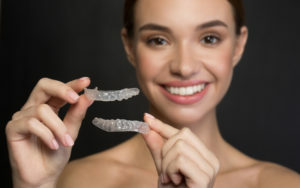 You simply wear your aligners for 20-22 hours each day (and overnight), and by switching out the aligners each week, your teeth shift into a straight smile over time. The benefit of this restorative dentistry option is that you are actually fixing the root cause of oral health problems. Crooked teeth cause tooth decay and gum disease to worsen, but you avoid that with a straight smile. With other restorative dentistry options (such as teeth whitening or veneers), you will still have the crooked teeth (although masked), and possibly the dental problems. Avoid all that while still getting a beautiful smile with Invisalign. If you want to learn more about this restorative dentistry option for adults and teens, contact Belmar Orthodontics today at (303) 225-9016!